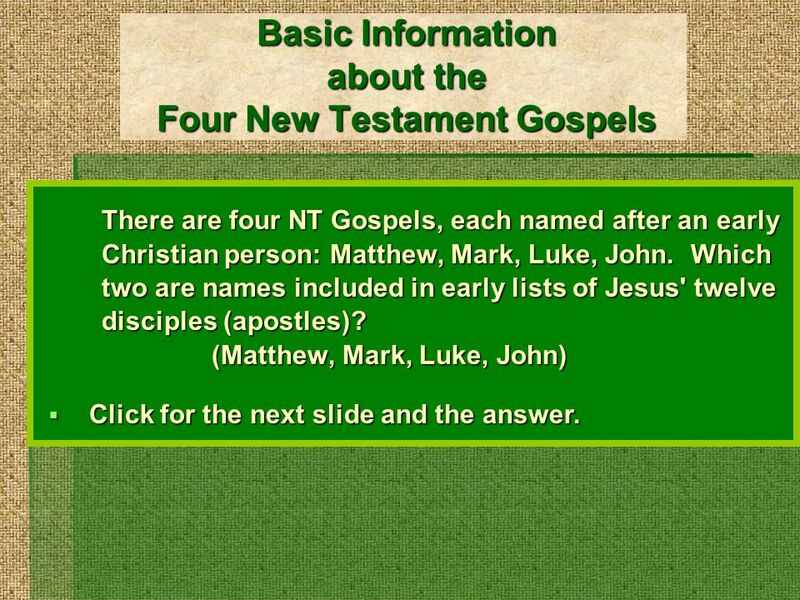 Basic Information about the Four New Testament Gospels There are four NT Gospels, each named after an early Christian person: Matthew, Mark, Luke, John. 1 Basic Information about the Four New Testament Gospels There are four NT Gospels, each named after an early Christian person: Matthew, Mark, Luke, John. Which two are names included in early lists of Jesus' twelve disciples (apostles)? 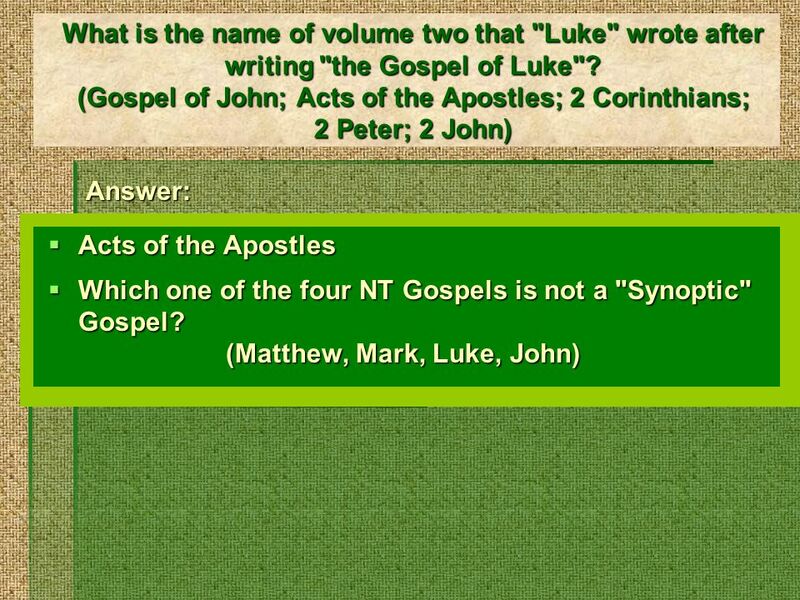 (Matthew, Mark, Luke, John)  Click for the next slide and the answer. 2 There are four NT Gospels, each named after an early Christian person: Matthew, Mark, Luke, John. Which two are names included in early lists of Jesus' twelve disciples (apostles)? 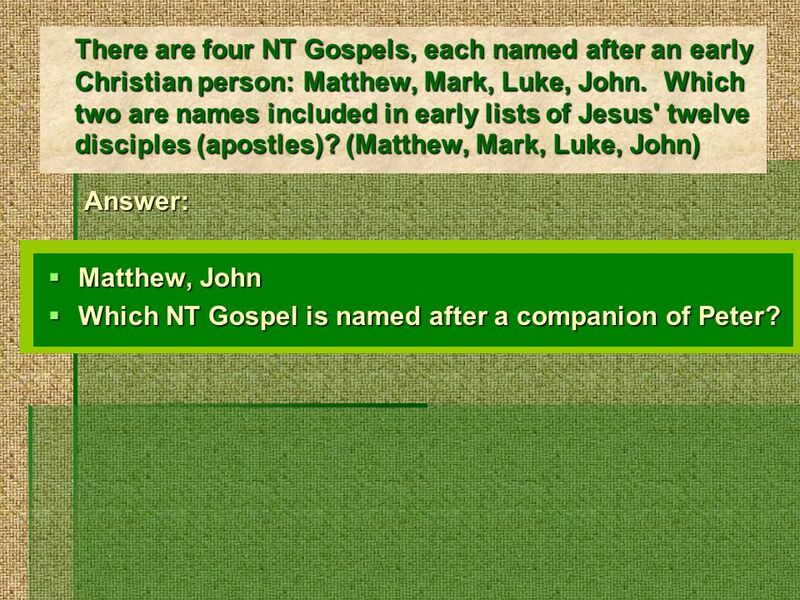 (Matthew, Mark, Luke, John) Answer: Answer:  Matthew, John  Which NT Gospel is named after a companion of Peter? 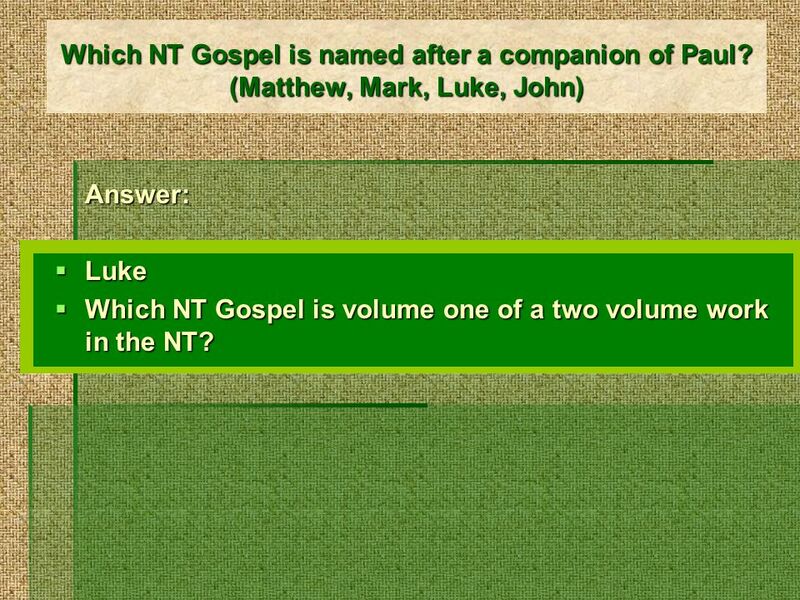 3 Which NT Gospel is named after a companion of Peter? (Matthew, Mark, Luke, John) Answer:  Mark, known as John Mark.  Which NT Gospel is named after a companion of Paul? 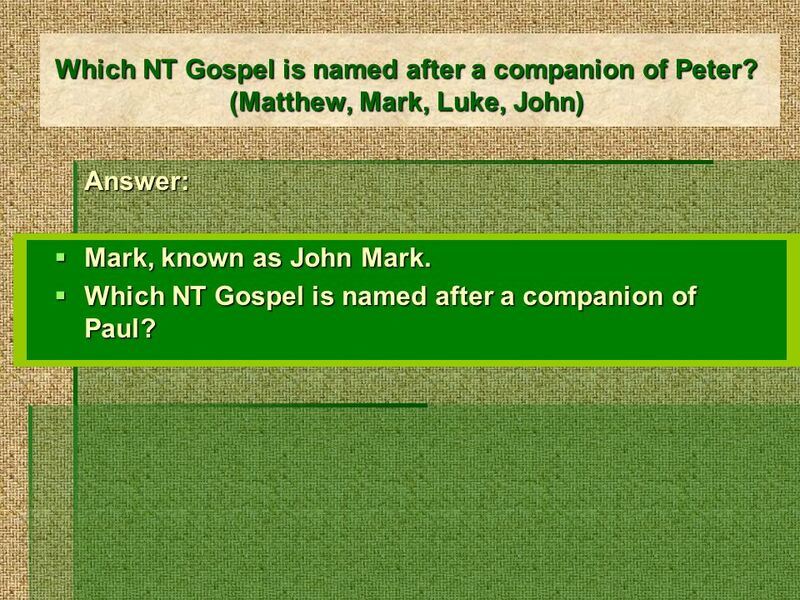 4 Which NT Gospel is named after a companion of Paul? 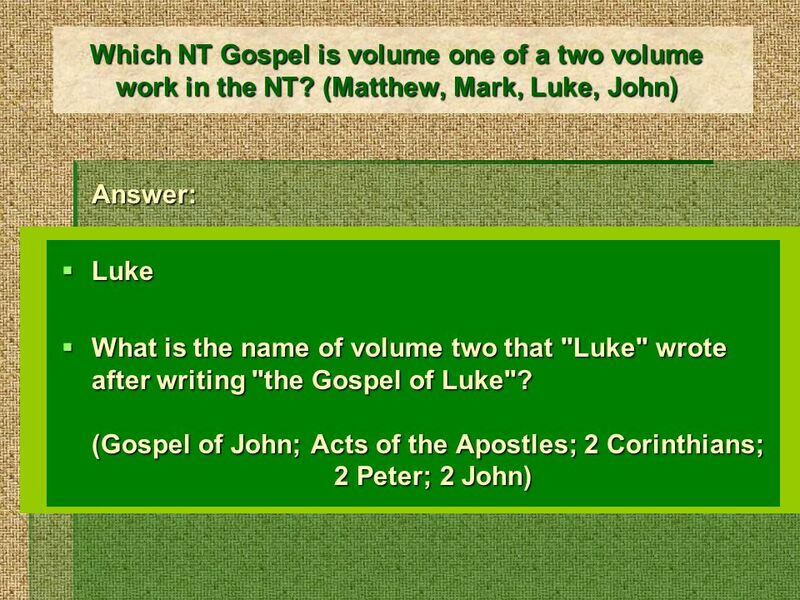 (Matthew, Mark, Luke, John) Answer:  Luke  Which NT Gospel is volume one of a two volume work in the NT? 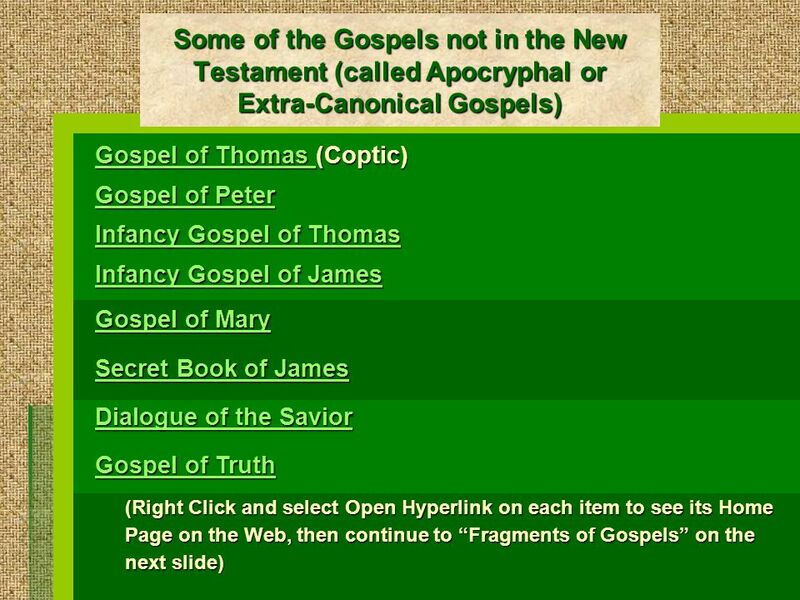 7 Which one of the four NT Gospels is not a "Synoptic" Gospel? 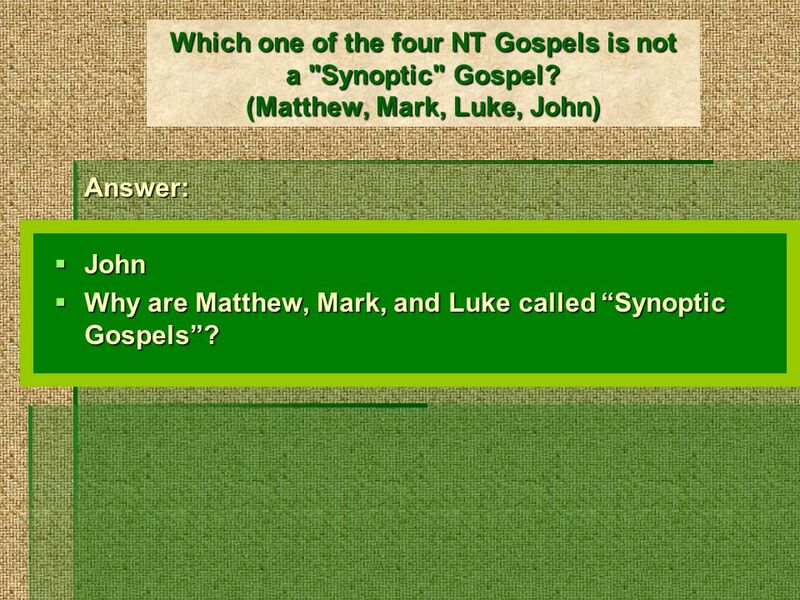 (Matthew, Mark, Luke, John) Answer:  John  Why are Matthew, Mark, and Luke called “Synoptic Gospels”? 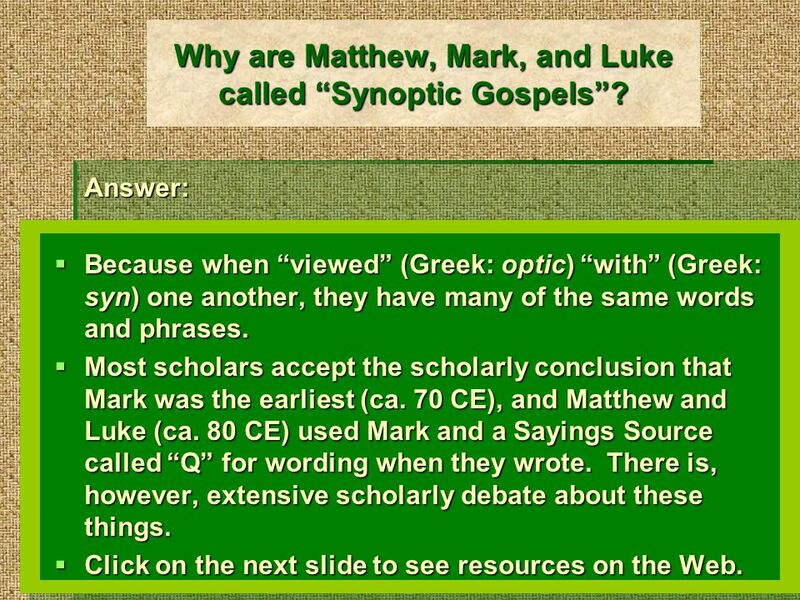 8 Why are Matthew, Mark, and Luke called “Synoptic Gospels”? Answer:  Because when “viewed” (Greek: optic) “with” (Greek: syn) one another, they have many of the same words and phrases.  Most scholars accept the scholarly conclusion that Mark was the earliest (ca. 70 CE), and Matthew and Luke (ca. 80 CE) used Mark and a Sayings Source called “Q” for wording when they wrote. There is, however, extensive scholarly debate about these things.  Click on the next slide to see resources on the Web. 10 Which NT Gospel starts with: "The beginning of the good news of Jesus Christ, the Son of God"? (Matthew, Mark, Luke, John) Which NT Gospel starts with: "The beginning of the good news of Jesus Christ, the Son of God"? (Matthew, Mark, Luke, John) Answer:  Mark  Which NT Gospel begins "An account of the genealogy of Jesus the Messiah, the son of David, the son of Abraham"? 11 Which NT Gospel begins "An account of the genealogy of Jesus the Messiah, the son of David, the son of Abraham"? 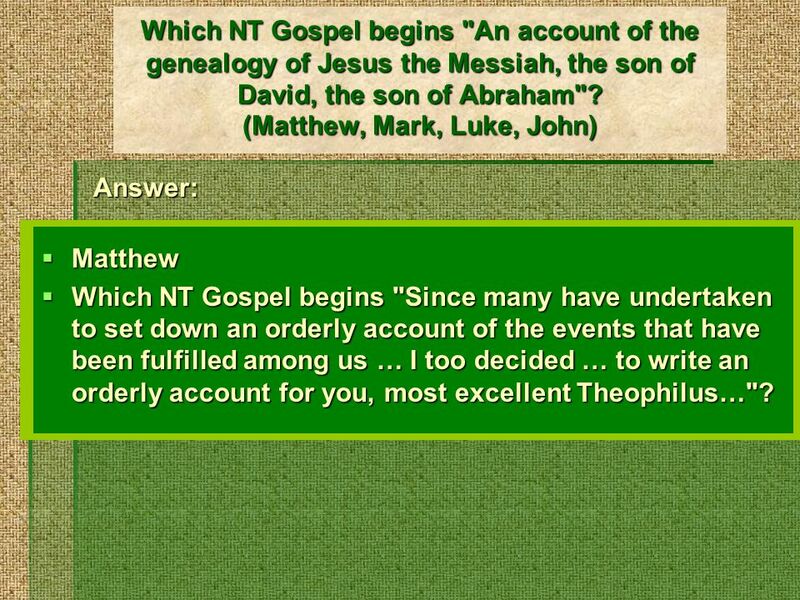 (Matthew, Mark, Luke, John) Answer: Answer:  Matthew  Which NT Gospel begins "Since many have undertaken to set down an orderly account of the events that have been fulfilled among us … I too decided … to write an orderly account for you, most excellent Theophilus…"? 12 Which NT Gospel begins "Since many have undertaken to set down an orderly account of the events that have been fulfilled among us … I too decided … to write an orderly account for you, most excellent Theophilus…."? (Matthew, Mark, Luke, John) Which NT Gospel begins "Since many have undertaken to set down an orderly account of the events that have been fulfilled among us … I too decided … to write an orderly account for you, most excellent Theophilus…."? 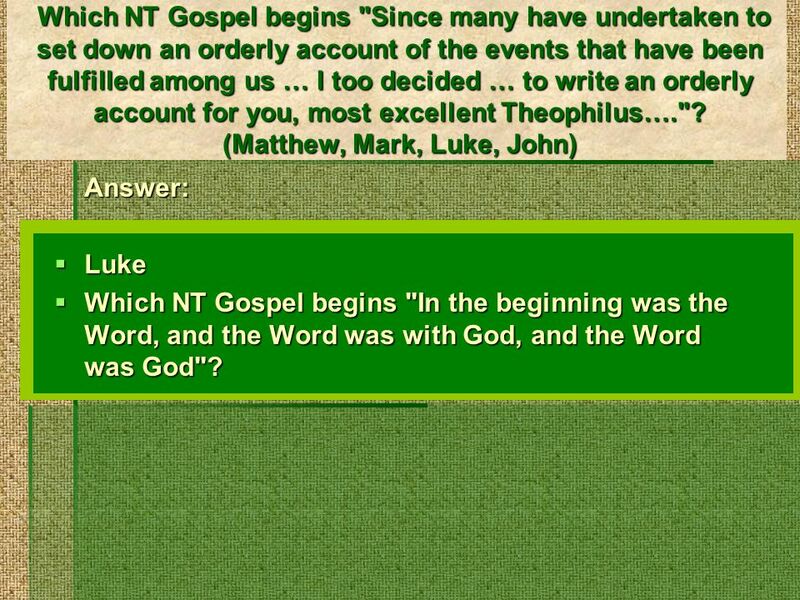 (Matthew, Mark, Luke, John) Answer:  Luke  Which NT Gospel begins "In the beginning was the Word, and the Word was with God, and the Word was God"? 13 Which NT Gospel begins "In the beginning was the Word, and the Word was with God, and the Word was God"? 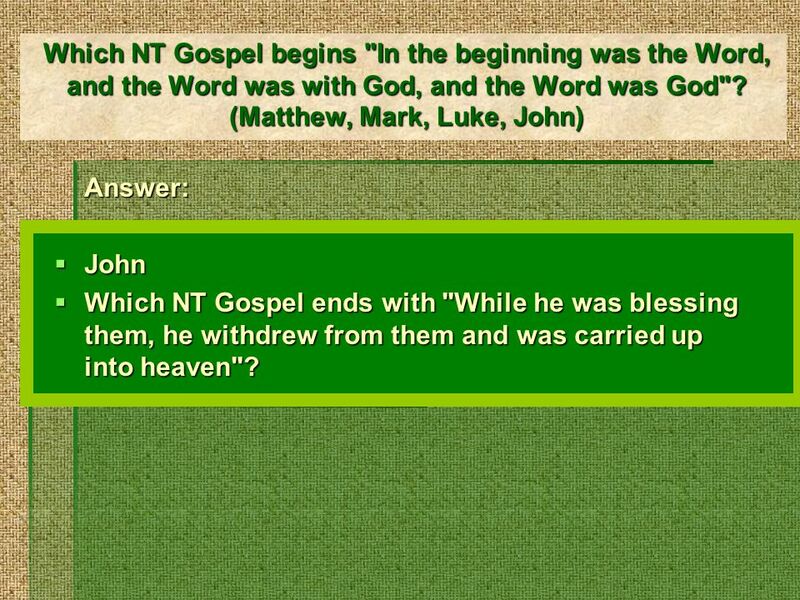 (Matthew, Mark, Luke, John) Answer:  John  Which NT Gospel ends with "While he was blessing them, he withdrew from them and was carried up into heaven"? 14 Which NT Gospel ends with "While he was blessing them, he withdrew from them and was carried up into heaven"? 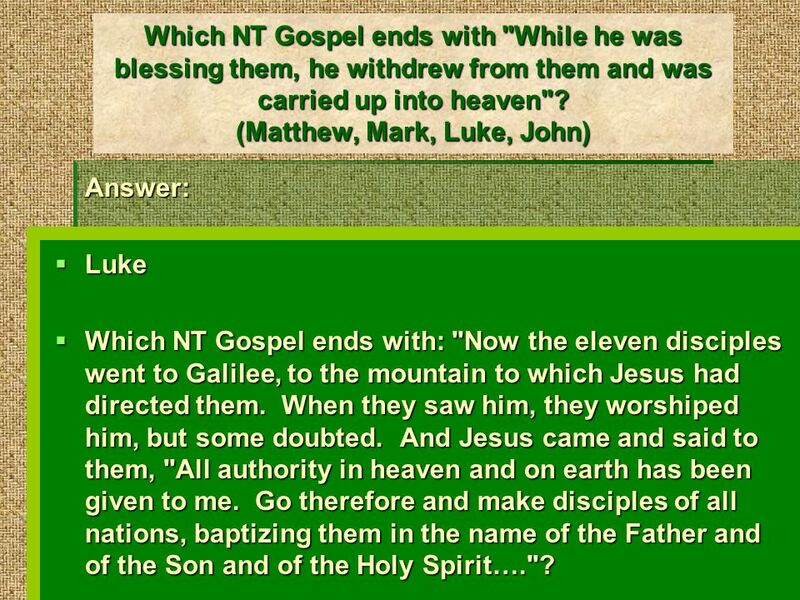 (Matthew, Mark, Luke, John) Answer:  Luke  Which NT Gospel ends with: "Now the eleven disciples went to Galilee, to the mountain to which Jesus had directed them. When they saw him, they worshiped him, but some doubted. And Jesus came and said to them, "All authority in heaven and on earth has been given to me. Go therefore and make disciples of all nations, baptizing them in the name of the Father and of the Son and of the Holy Spirit…."? 15 Which NT Gospel ends with: "Now the eleven disciples went to Galilee, to the mountain to which Jesus had directed them. When they saw him, they worshiped him, but some doubted. And Jesus came and said to them, "All authority in heaven and on earth has been given to me. Go therefore and make disciples of all nations, baptizing them in the name of the Father and of the Son and of the Holy Spirit…."? 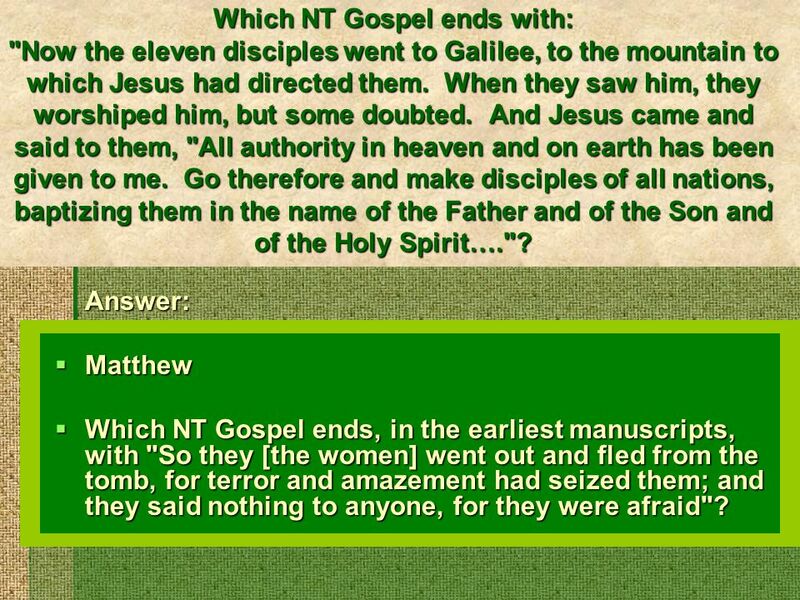 Answer:  Matthew  Which NT Gospel ends, in the earliest manuscripts, with "So they [the women] went out and fled from the tomb, for terror and amazement had seized them; and they said nothing to anyone, for they were afraid"? 16 Which NT Gospel ends, in the earliest manuscripts, with "So they [the women] went out and fled from the tomb, for terror and amazement had seized them; and they said nothing to anyone, for they were afraid"? 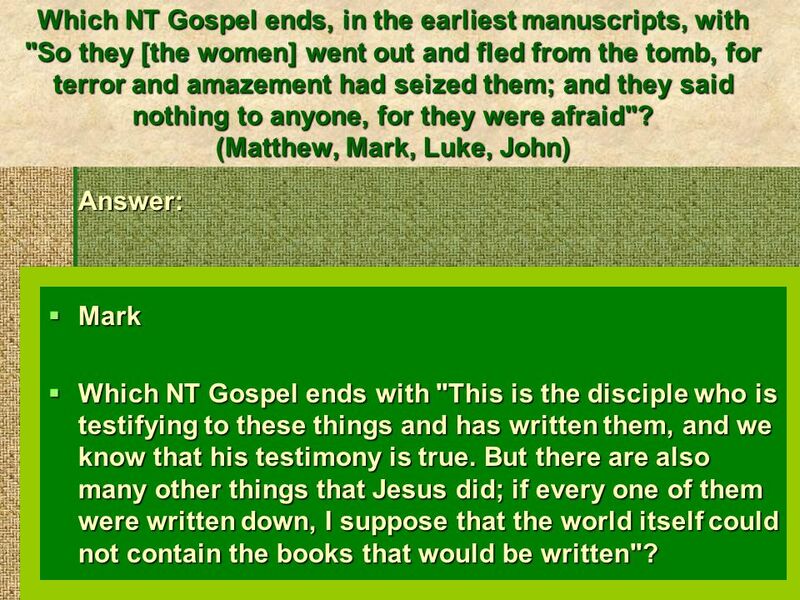 (Matthew, Mark, Luke, John) Answer:  Mark  Which NT Gospel ends with "This is the disciple who is testifying to these things and has written them, and we know that his testimony is true. But there are also many other things that Jesus did; if every one of them were written down, I suppose that the world itself could not contain the books that would be written"? 17 Which NT Gospel ends with "This is the disciple who is testifying to these things and has written them, and we know that his testimony is true. But there are also many other things that Jesus did; if every one of them were written down, I suppose that the world itself could not contain the books that would be written"? Which NT Gospel ends with "This is the disciple who is testifying to these things and has written them, and we know that his testimony is true. But there are also many other things that Jesus did; if every one of them were written down, I suppose that the world itself could not contain the books that would be written"? 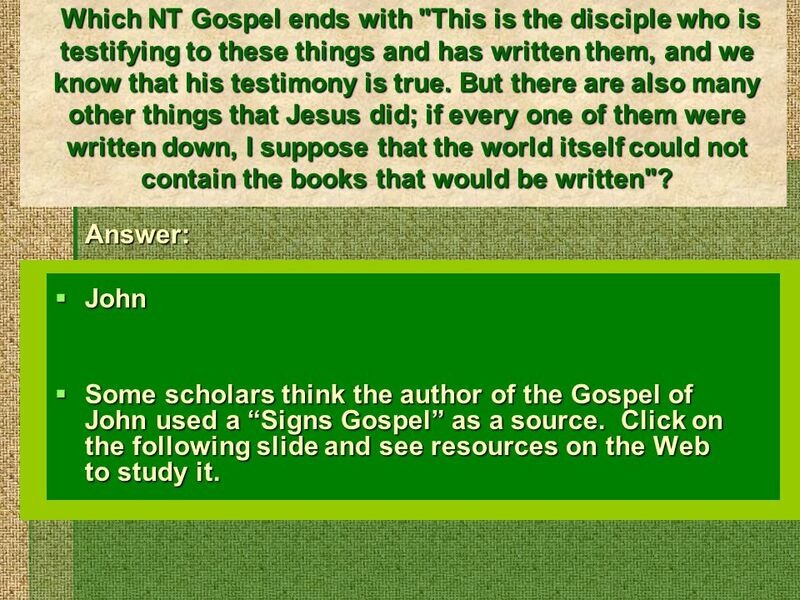 Answer:  John  Some scholars think the author of the Gospel of John used a “Signs Gospel” as a source. Click on the following slide and see resources on the Web to study it. 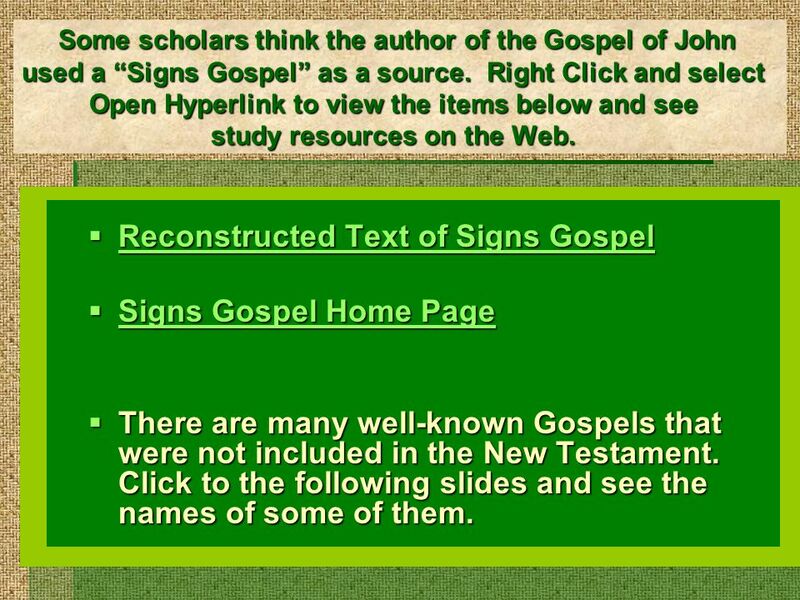 18 Some scholars think the author of the Gospel of John used a “Signs Gospel” as a source. Right Click and select Open Hyperlink to view the items below and see study resources on the Web. Some scholars think the author of the Gospel of John used a “Signs Gospel” as a source. Right Click and select Open Hyperlink to view the items below and see study resources on the Web. 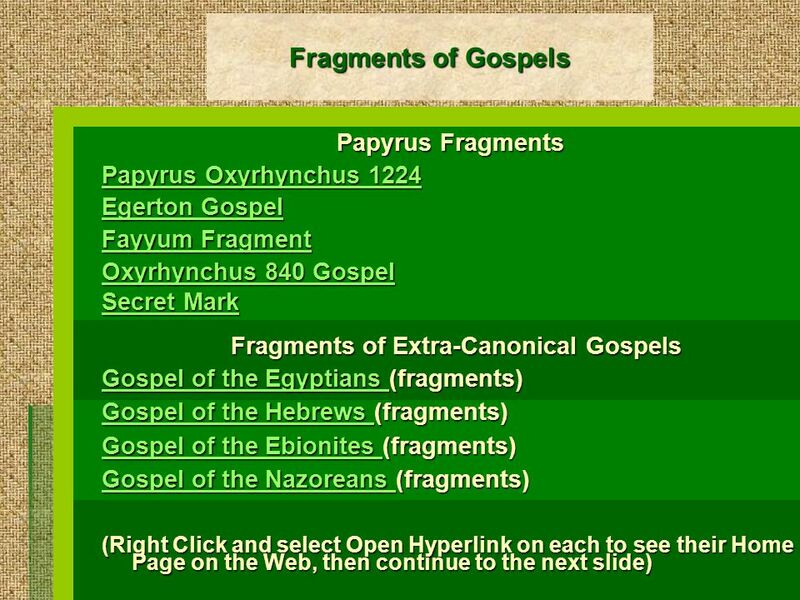  Reconstructed Text of Signs Gospel Reconstructed Text of Signs Gospel Reconstructed Text of Signs Gospel  Signs Gospel Home Page Signs Gospel Home Page Signs Gospel Home Page  There are many well-known Gospels that were not included in the New Testament. Click to the following slides and see the names of some of them. 21 Congratulations! Good Work! 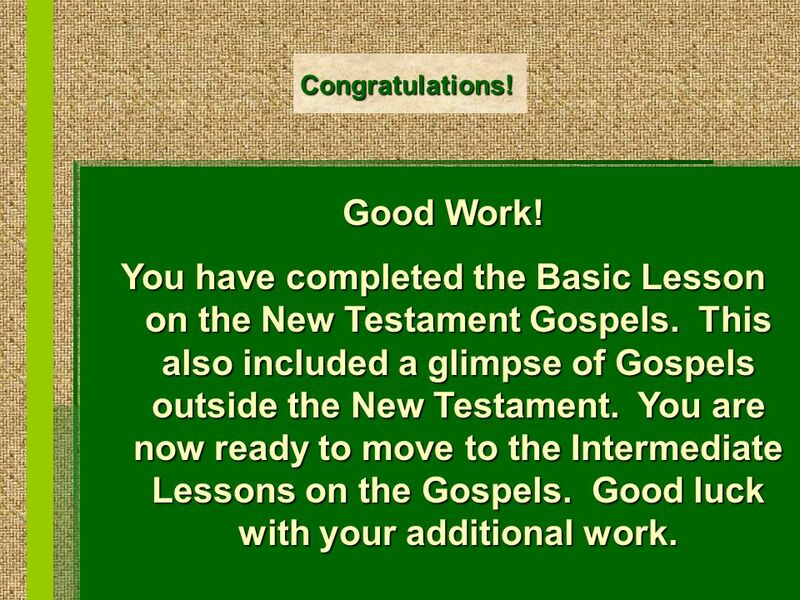 You have completed the Basic Lesson on the New Testament Gospels. This also included a glimpse of Gospels outside the New Testament. You are now ready to move to the Intermediate Lessons on the Gospels. Good luck with your additional work. Download ppt "Basic Information about the Four New Testament Gospels There are four NT Gospels, each named after an early Christian person: Matthew, Mark, Luke, John." Lesson 22 The Three-fold Office of Christ. Read: Matthew 3:13-17; Mark 1:9-11; Luke 3:21,22; John 1:31-34. Then the eleven disciples went to Galilee, to the mountain where Jesus had told them to go. When they saw him, they worshiped him; but. Well, I say it was divine providence that escaped us from jail. Acts 1:1-5. “The Ascension of Jesus” Acts 1:1-11 Mark 16:15-20 Luke 24:50-53. Matthew 28:16-20 The Great Commission 16 Then the eleven disciples went to Galilee, to the mountain where Jesus had told them to go. 17 When they saw. I Believe That The Tomb Was Found Empty John 20:1-10 Song # 413. Introduction to. Opening words… John: In the beginning was the Word, and the Word was with God, and the Word was God. He was with God in the beginning. Mentor/Apprentice. Gospel. Community. Mission. Question 1: In what ways, are you a disciple or student learning from someone else? Is there a mentor figure. The Christian Scriptures Canon of the New Testament.